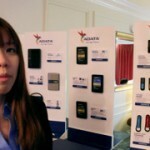 ADATA’s Marketing Manager Cherry Law is fun, smart and loves explaining their line of DashDrive Elite USB 3.o Flash Drives! We have seen a lot from ADATA this year, but to get this whole line of sleek flash drives with capacities up to 64 GB is pretty incredible! CES 2013 allowed them to show off a lot. Good work ADATA! It will be a promising 2013! This entry was posted in ADATA Technology, USB 3.0 Flash Drives and tagged ADATA, DashDrive Elite, USB 3.0 Flash Drive, USB drive. Bookmark the permalink.